We have now covered 4 of the examples I plan to review on how to get music images into blogs and documents. This is Part 3 in my series Musical Snippets for Sharing. This post will cover the last two examples – fret diagrams. Anyone who plays a fretted instrument has encountered chord diagrams. Chord diagrams visually illustrate where to put your fingers on the frets. Although the same information is conveyed by TAB, the chord diagram is closer to a picture of how to play the chord. In fact, some books of chords just show photographs of someone playing each chord. The 6th example I want to cover is a scale diagram. It could be a “lick” diagram. It shows all the finger positions that will be used to play a scale or lick or other short piece – usually only a bar or two in length. It is different from a chord diagram only because each string may show more than one finger position. 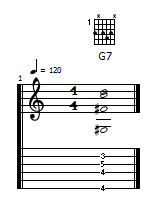 It conveys less information than the TAB for the same lick because the diagram does not show the sequence the notes are played in. It is used less frequently than chord diagrams but might still be useful as supplemental information to playing a lick with unusual or difficult finger positions. I like scale/lick diagrams as a supplement to TAB or standard notation because they prepare me for what is coming. Where do my fingers go next? The diagrams show me. Methods to create fret diagrams. 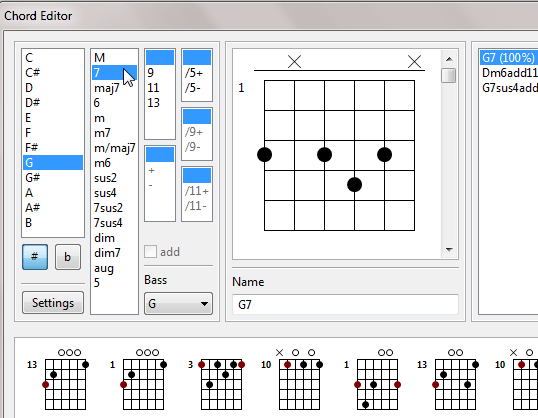 Use TuxGuitar to create and save chord diagrams. Use chord diagram software such as QwikChord3. Create diagrams with graphics software. Use Lilypond notation software directly. Most tab creation software allows you to create chord diagrams and insert the diagrams above the music notation and tab. 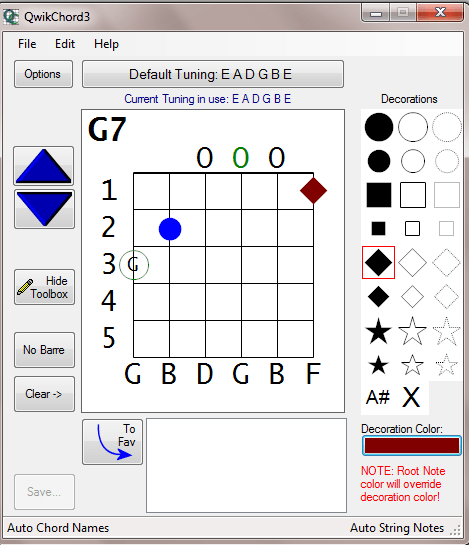 TuxGuitar is typical with a chord library of chord forms you can choose from. However, you can also just enter the finger positions on the chord diagram. You can capture what’s displayed on the screen and crop it to just the diagram then insert the image where you need it. You could capture the small diagrams in the library as well as the large diagram you’ve selected or edits. Easy but not the highest resolution. You can also display chords along with tab and notation and could create images by any of the method discussed in the previous article. Examples are shown below. 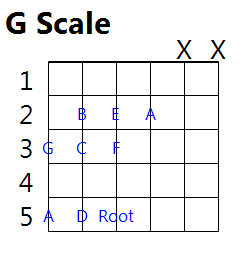 However, if you’re trying to build a chord reference for beginners, this probably isn’t what you wanted. 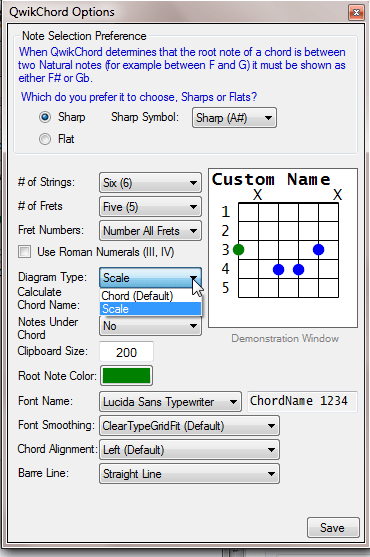 QwikChord3 is a free Windows software program made specifically for creating fret diagrams. 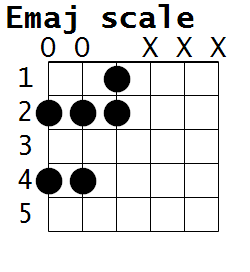 It can create scale diagrams as well as standard chord diagrams. It can try to tell you what chord you’ve entered. You can specify the number of strings and the tuning so it is useful for banjos, mandolins, ukuleles as well as for open and alternate tunings for guitar. You can save your diagrams by clicking on the “To Fav” button and then export them to a graphic file by clicking on the “Save” button. When saving you can specify the size of the image created. There are a lot of options including different symbols and colors that can be used on the diagram from the toolbox. One of my favorite toolbox options is the use the one labeled “A#”. Choose that then click on any string/fret and the name of the note will be entered. You can also right click and enter any text you like, as I did for root in the G scale image. 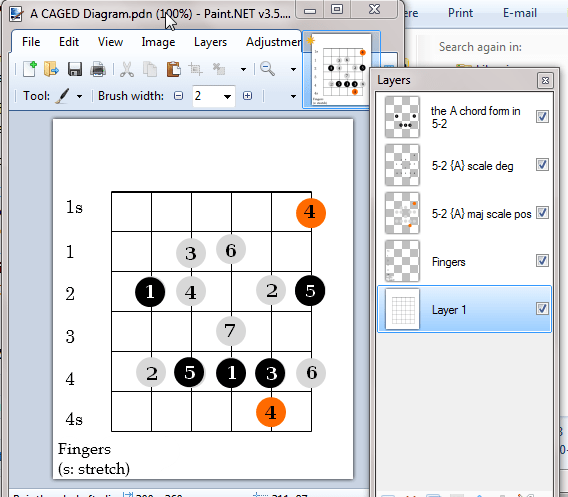 You can create fret and scale diagrams with a graphics program. Bitmap software such as GIMP, Paint.net or PhotoShop could be used or a vector based program such as Inkscape. Either way, having layers gives you flexibility to label diagrams different ways. 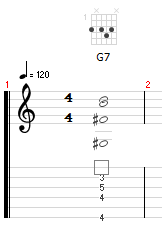 The hardest part of using a graphic program is you must first create a blank diagram of the fretboard. But once you have that done, you can use it as a template for everything else. Here’s some hints on using layers. 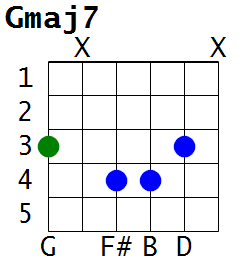 Make each chord or scale diagram a new layer. You can make alternate ways of showing the same chord or scale by putting finger positions as closed circles in one layer, note names in the chord/scale in another layer and scale degrees in another. Hide layers you don’t want for any particular image. Be sure to save the diagram with all the layers in the file format the software uses instead of a graphics format. I’m not going to kid you. Attempting to learn Lilypond so you can make chord or scale diagrams isn’t easy. I’m going to show you some cool things I’ve discovered and which you can copy and modify as needed. But Lilypond is complex. You can do much more than I’m showing but even I wouldn’t try. One of the things I’ve found people asking about on the web is whether you can do scale diagrams in Lilypond and I’ve seen some people conclude you can’t. That is not true. Once you’ve learned to make a chord diagram, a scale diagram is easy. Lilypond does not prevent you from putting multiple finger positions on the same string when you create diagrams from scratch. Here’s some example Lilypond markup. You can copy/paste this into a plain text file with a .ly extension and compile it with the commands or batch file I provided in the previous post. Here’s the output produced from the above code. I tried your example in lilypond and have 2 issues. I posted on the lilypond mailing list and wonder if you ran into those issues and found a way around them. I took a look at your post over at lilypond but saw nothing obvious that could help you. I congratulate you on the attempt at using lilypond this way. It should be doable. But here are some points to keep in mind. 1st, I wrote that post nearly 3 years ago. Lilypond has evolved. Maybe there’s an easier way. If so, I don’t know it. 2nd, I wrote the following in the post: “I’m not going to kid you. Attempting to learn Lilypond so you can make chord or scale diagrams isn’t easy. … You can do much more than I’m showing but even I wouldn’t try.” I haven’t used Lilypond for some time. I wish I could help but I use other software for the purpose. Which brings me to the last thing – I recently reviewed software I currently use that will accomplish at least part of what you want. It still might not solve all your problems but it should get the diagram better than your example. See Fret Diagram Software – Update 2014. Good luck no matter how you proceed. I regret I’m not more help.